Age Limit as on closing date. ii) Fourteen years of teaching and/or research experience in a recognized institution in the subject of speciality after obtaining the qualifying degree of M.D./M.S. or qualification recognized equivalent thereto. ii) M.Ch. for surgical super -specialities and D.M. for Medical super specialities (2 years or 3 years or 5 years recognized course) or a qualification recognized equivalent thereto. Eleven years teaching and/or research experience in recognized Institution in the subject of speciality for the candidates possessing 3 years recognized a degree of D.M/M.Ch in the respective discipline/subject or a qualification recognized equivalent thereto. iii) Four years teaching and/or research experience in a recognized institution in the subject of specialty after obtaining the qualifying degree of D.M. /M.Ch. (2 years or 5 years recognized course after MBBS) in the respective discipline/subject or a qualification recognized equivalent thereto. Entry Level Pay Matrix 12 (Basic ₹1,01,500) and all usual allowance (Plus NPA for medically qualified candidates only) After three years, Assistant Professors will move to level 13 (Basic 1,23,100) of the Pay Matrix. 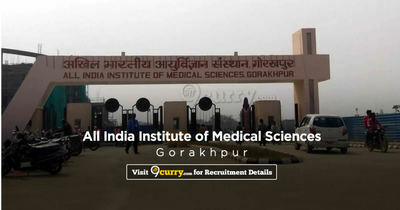 Eligible candidates may apply online at AIIMS Gorakhpur's website (direct link is given below) from 23 Mar 2019 to 22 Apr 2019. AIIMS Mangalagiri Recruitment 2019 - Job notification for 24 Faculty Posts in AIIMS Mangalagiri, Mangalagiri, Andhra Pradesh on Regular Basis. Applications are invited by All India Institute of Medical Sciences, Mangalagiri, Andhra Pradesh on or before 30 Apr 2019 05:00 PM for 24 vacancies.